The program obtains size and location of the impact zones of energetic particles from the Sun, i.e. a circular belt of auroral emissions around each geomagnetic pole. These belts are known as the auroral ovals. The relationship between the morphology of the auroral oval and the level of geomagnetic activity allows us to develop models of the location of the aurora, independent of the vagaries of auroral observations. In addition, new models have evolved that use data of particle precipitation measured by polar orbiting satellites. The two methods by Starkov (1994) and Zhang & Paxton (2008) are used to mathematically calculate the size and location of the auroral oval mapped onto a solar illuminated Earth globe. 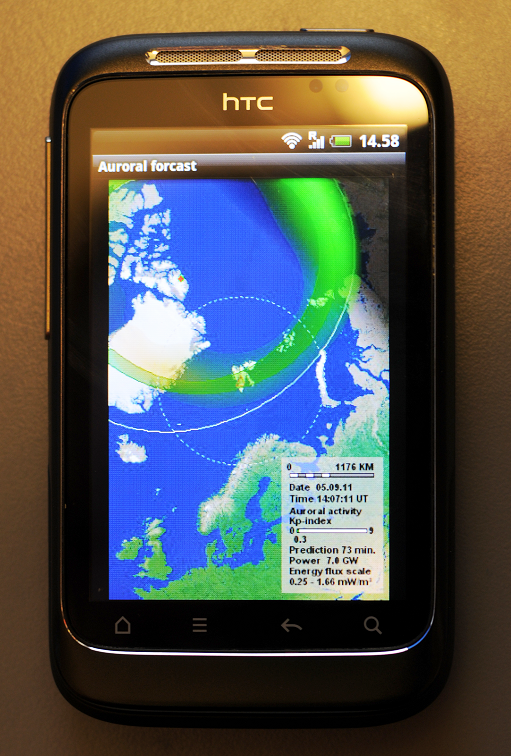 The auroral forecast on a HTC wildfire phone. Photo and text: F. Sigernes @UNIS (2011). Both models only use planetary Kp index and time as input, which makes them ideal candidates for forecasting aurora when the predicted Kp value is estimated by the Space Weather Prediction Centre (NOAA-SWPC) using satellite data one hour upstream in the solar wind (Sigernes et al. 2011a; 2011b). The program is freeware and can be downloaded here or get it directly by using your phone's barcode scanner (QR-code). There are many requests from iPhone users. 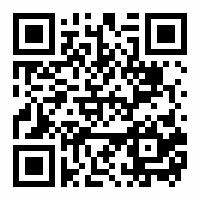 As a preliminary solution, use this web-based mobile link. Hint: Bookmark your station of interest. F. Sigernes, M. Dyrland, P. Brekke, E. K. Gjengedal, S. Chernouss, D. A. Lorentzen, K. Oksavik and C. S. Deehr, Real time aurora oval forecasting – SvalTrackII, Optica Pura y Aplicada (OPA), 44, 599-603, 2011a. F. Sigernes, M. Dyrland, P. Brekke, S. Chernouss, D.A. Lorentzen, K. Oksavik, and C.S. Deehr, Two methods to forecast auroral displays, Journal of Space Weather and Space Climate (SWSC), Vol. 1, No. 1, A03, DOI:10.1051/swsc/2011003, 2011b. Zhang Y., and L. J. Paxton, An empirical Kp-dependent global auroral model based on TIMED/GUVI data, J. Atm. Solar-Terr. Phys., 70, 1231-1242, 2008. We wish to thank the National Oceanic and Atmospheric Administration (NOAA) - Space Weather Prediction Centre for allowing us to download the predicted value of the estimated Kp index every 15 minutes. The work is financially supported by The Research Council of Norway through the project named: Norwegian and Russian Upper Atmosphere Co-operation On Svalbard part 2 # 196173/S30 (NORUSCA2), the Nordic Council of Ministers: Arctic Cooperation Programme # A10162, and COST action ES0803.